Buffalo Sabres head coach Dan Bylsma earned the reputation of being a habitual line juggler last season. The majority of his line adjustments can be chalked up to the new coach becoming familiar with his club, as in the second half of the season the juggling subsided considerably. However, only four games into this season, Bylsma is at it again with the Shuffling. 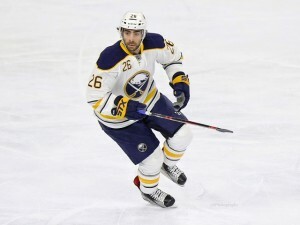 After scoring two goals in the first four games of the season, winger Matt Moulson earned himself a slot on the top line with Ryan O’Reilly and Kyle Okposo. Moulson has already looked better than he did most of last season. He’s getting more scoring opportunities and becoming an important part of the power play again. Also, Moulson has experience playing with Okposo from his time with the New York Islanders. 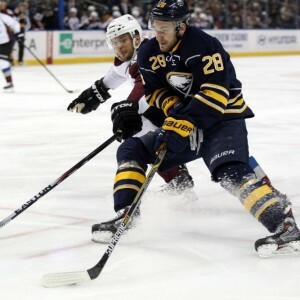 Bylsma is hoping the two can reignite their former chemistry and build upon the quick chemistry Okposo has found with O’Reilly. The move also allows the club to put together two scoring lines, instead of one top scoring line. The counter move to promoting Moulson to the top line was moving Sam Reinhart back to his Junior position at center on the second line. When Jack Eichel was injured, it seemed like the most logical replacement would be Reinhart to slot into the vacated role. After a few games, Bylsma decided to give the idea a try. As I mentioned, Reinhart played the center position throughout his Junior career and was drafted as a center. He was moved to the wing upon arriving in Buffalo for an easier transition to the NHL. Also with Eichel and O’Reilly occupying the top two center roles, the wing made the most sense for the 2014 second-overall pick. The long-term plan for the Sabres may be to move Reinhart back to his natural position. How this experiment goes will determine if the Sabres want to pursue that path or leave him as a winger on Eichel’s return. Reinhart will be accompanied by Tyler Ennis and Zemgus Girgensons, and all three players are in need of a boost. Dan Bylsma on if Reinhart is a center long-term: "Long-term I like him playing next to Eichel or O'Reilly and that means he's playing wing." Speaking of Girgensons, he’s headed back to the wing after four games at center. It’s starting to become more apparent that Girgensons may not be a fit as a center in the NHL. He performed better playing on the wing with Eichel and Reinhart last season. Through the first four games, the 2012 first-round pick continues to struggle. He’s nonexistent offensively, which has prompted Bylsma to put him back with two players he’s had prior success with, Ennis and Reinhart. If the struggles continue for the 22-year-old, where he fits on the roster could come up again. He’s back to being juggled around the lineup looking for a position in which he can be a productive player for the Sabres. The team may come to a point where they believe he’s just not a fit for the club and could look to make a move. Still, there’s time for that story to play out. One of the more surprising lineup changes was the breakup of the second pair of Zach Bogosian and Jake McCabe. The duo played very well to end last season and was playing well to start this season. On the flip side, they weren’t playing at the level in which they finished the prior campaign. This move may be more about Dmitry Kulikov than the play of McCabe or Bogosian. Kulikov has looked good and has been earning more minutes every game. Bylsma indicated his desire to ease the Russian defender back into the lineup after his preseason injury. Now that he’s become more comfortable in the system, Bylsma wants to get the 25-year-old more ice time in bigger roles. As long as Bylsma remains intent on keeping together the pair of Rasmus Ristolainen and Josh Gorges, Kulikov will likely stay on the second pair with either Bogosian or McCabe. The belief in the summer was Kulikov was brought in to play with Ristolainen, but we’ve only seen that pair sparingly so far. Eventually, he’ll end up on the top pair, but according to practice pairings, he’ll play with Bogosian against the Philadelphia Flyers.